WE’VE all seen our fair share of emails that fall flat. They’re boring. They’re too sales-y. They aren’t relevant to our interests. And they come en masse. In fact, data from Radicati indicates that in 2016, there are more than 116.4B business emails sent and received per day. That’s a lot of competition in the email inbox, don’t you think? 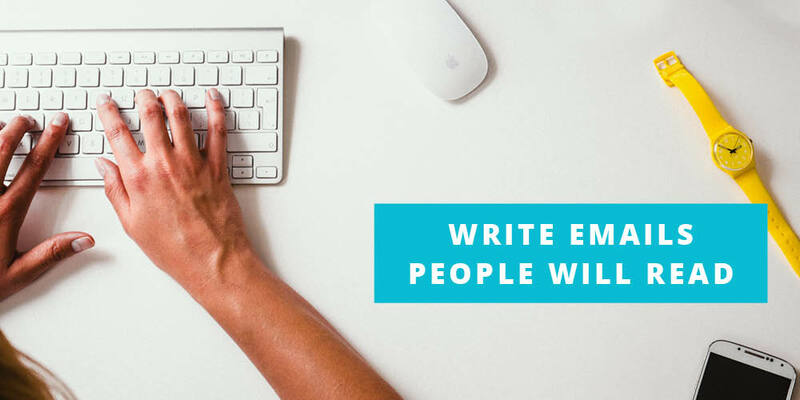 If you want to stand out from the billions of emails zooming around the planet each day, you need to write emails people want to read. How do you do that? We’ve talked about mastering the subject line, but today let’s look at the email message body. Here are a few specific tactics that can help you do just that. 1. Write for one reader, not a large, faceless audience. People want personalized messages that feel like individual correspondence – not a mass message that pays no attention to their unique wants, needs, and pain points. You can make your emails feel like human correspondence (not automated noise) by taking a stripped back approach to email marketing. Sometimes, that even means ditching the pretty email template and writing messages that are bare bones – and look like a personalized email between two individuals. 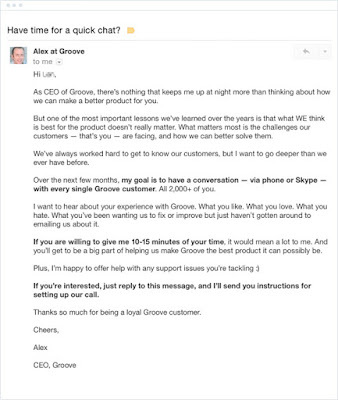 Notice how he’s reaching out to his user base and talking about their needs rather than pushing the product? 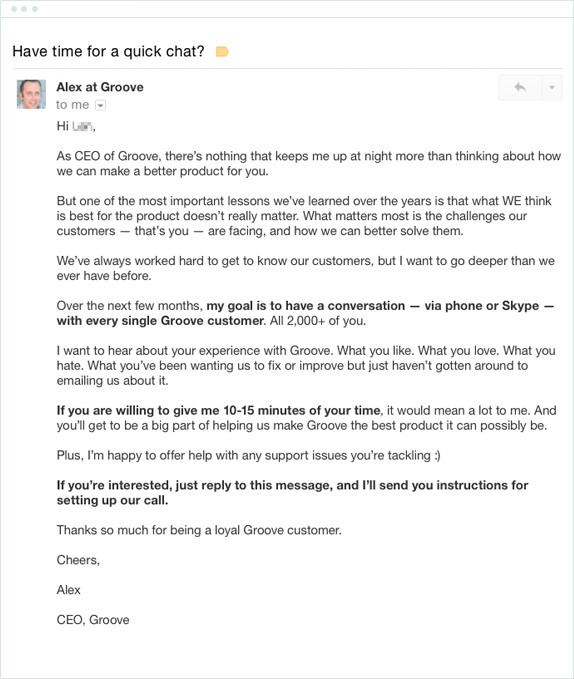 That’s an email worth reading that builds loyalty and relationships with customers. 2. Talk about benefits, not features. Effective emails don’t sell, they convince readers to buy on their own. Readers have a “what’s in it for me” mentality – which is why spotlighting the benefits you can provide is such an effective way to make your product/service more appealing. Features are great, but benefits and tangible outcomes are much, much better. Our new salt lamp comes in three sizes, has an automatic three-hour shut off, and is the perfect night light for any bedroom. Tired of asthma-related symptoms and poor sleep habits? Our new salt lamp can help you fall asleep faster and more soundly while easing the painful sneezing and itching associated with seasonal allergies. Notice how one version solves a problem, while the other just lists some features? Your readers want to hear the problem-solving benefits of what you can offer – not a straight up sales pitch. Talk about what’s in it for them. Sure, you can use pictures and graphics within your emails – but these should ultimately help tell a larger story about your brand. You need words to do this, too. 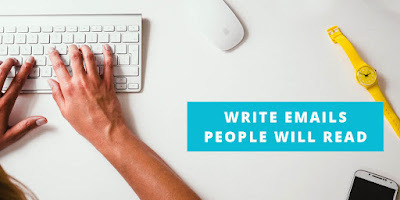 When writing email copy, think about creating a mental picture for the reader through storytelling. Why? Not only does this help the reader picture him/herself within the story, but it creates a setting in which they can visualize themselves using your products, too. It also adds a nice human element that’s missing from many promotional emails. This example from cycling brand Rapha does a nice job of marrying visuals and storytelling for an impactful email that truly resonates with readers. It eases the reader into the more promotional product section once the reader has been primed by the story. 4. Give them something valuable. Sales and discounts are great, but when you can teach your email subscribers a valuable lesson, you’re following what Gary Vaynerchuk calls the “jab, jab, jab, right hook” method. Your jabs are the continued value you provide readers, and the right hook is the follow through that compels them to convert when you finally make that ask. Value-packed emails are emails people want to read – which is why this format works well specifically for automated email series. Over the course of 5 – 10 emails, you can continually teach a lesson, walk someone through a tutorial, and generally nurture a lead until that person is ultimately ready to buy, convert, etc. Even for one-off email messages, remember: Your reader needs a compelling reason to open and read your message – so give them something valuable behind that great subject line. What’s one thing all four of these strategies have in common? They are backed with purpose – they’re not mindless messages that are easily lumped in with the million other promotional emails sent each day. What emails do you enjoy reading? And what makes them so great? We’d love to hear what works well for you.